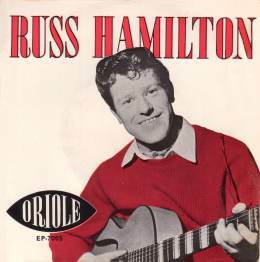 Russ Hamilton is one of the first singer-songwriters of 'pop' to have come out of Liverpool. Like many other entertainers of the era, his show business career stemmed from his job as a Butlin's 'Redcoat'. He and his fellow staff put together a skiffle group and were soon singing to the happy 'campers'. It was through this venture that he got an opportunity to cut his first disc. So in only a few months since completing his National Service he had gone through working in a factory to become a famous singing star. In the UK, it was 'We Will Make Love' that caught record buyers attention, whereas in the USA, it was the other side 'Rainbow' that fueled the public imagination. This led to the possibly unique situation of a single reaching the top 10 in the UK while its flipside achieved the same result across the Atlantic- 'Rainbow' reached #4 on the USA. In 1957, chart success in the USA was a very unusual feat for an English performer and made Russ a very hot property for a while. Despite this, Russ continued to maintain his association with the British holiday camp and had to commute from one side of the Atlantic to the other to meet the many demands for live performances. The EP on the left (Oriole EP7005) contained both sides of his most successful singles. It was to be the only EP that Russ would have issued in the UK- although an LP called "We Will Make Love" does exist. Neither of these UK issued discs is easy to find now, but I do see the EP now and then- this might be a nice way to obtain "We Will Make Love" or "Rainbow". Russ followed his first great success with another self penned item, allegedly written- as was his first UK hit- with his girl friend in mind, "Wedding Ring". This record too managed the top 20, but only just. It was insufficient to consolidate his position as a major pop star. His fortunes with record releases did not improve and by the early 1960s he had all but disappeared from foreground pop music. Sadly, his great hit also faded rapidly and has received little airplay in recent years- not only is it unfashionable in style, but the meaning of the lyric has suffered from the changes in word usage that have taken place since 1957. See lower list for EP releases. Oriole EP7005 1958 "Russ Hamilton" w.Johnny Gregory Orch.